Butterick 6133; ca. 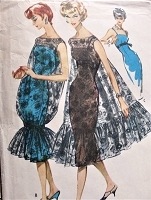 1952; Tiered Dress Plus Separate Skirt for Evening. Here’s a wonderful idea… a billowy, double-tiered, daylength dress to which you can add the separate, yoked floor-length skirt for formal occasions. Upper and lower tiers are stitched together at the waist. (B) Sleeveless.